It's been quite some time since I posted some spinster food. I will admit that this is not an original recipe. Before we go any further, here's the link. I, of course, found this on Pinterest, but the recipe is here on AllRecipes.com Of course, my photos is a little spooky since tomorrow's Halloween, but if you want to know what the recipe will really look like, then just visit AllRecipes. Now, a little background. When I went to do the Art in the House craft show, I was in the same room as the kitchen, and in the kitchen was one Reverend Josie Holler who makes all sorts of delicious concoctions. I bought a pint of her quinoa salad, and I loved it so much I ate it for breakfast the next day. The thing is, though, I don't live near Rev. 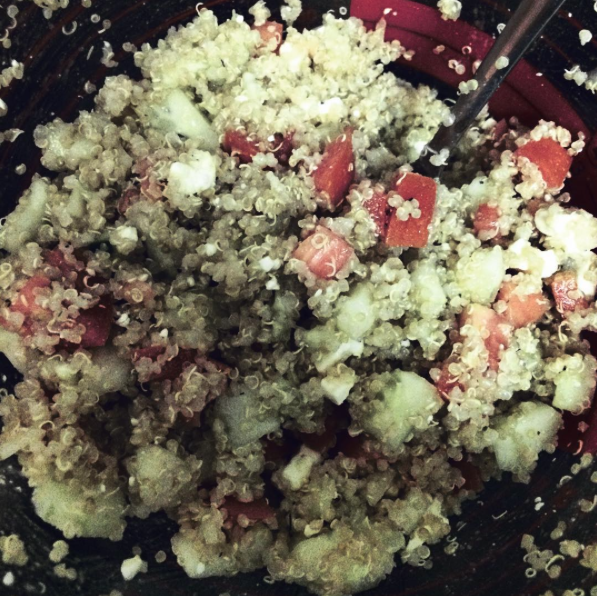 Holler, so I had to do my own research and make my own quinoa salad once I got back to Atlanta. 1. I probably added a bit less dill than the recipe called for. I just don't like dill that much. 2. I couldn't find a small cucumber, so I think I used a medium one, and I think I could have used half of it instead of the whole thing. 3. I eyeballed the feta cheese because I thought the recipe maybe was a little disproportionate. I think it turned out delicious, but I bet it's great with whatever customizations you could think of. I just wanted to share the recipe and the idea. I'm excited I have an exciting little quinoa salad waiting for me come lunch time. Well...and then lunch again tomorrow. 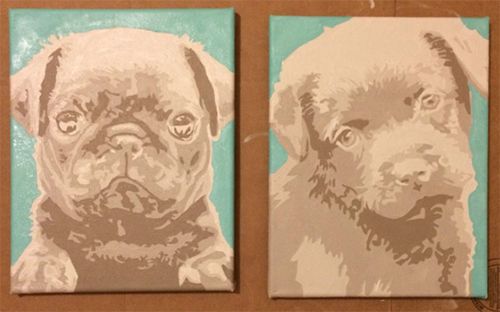 If you've been following my instagram, you know I've been working on a triptych of portraits of children. Painted portraits comprise most of my Christmas orders, but this one was ordered a long time ago. In between dryings, though, I've been working on a new coloring book. 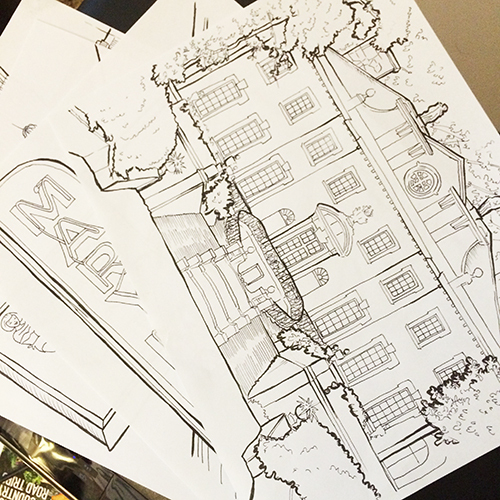 It's an Atlanta coloring book. Because it's a city, I've been doing a lot of architectural drawings, and that is a serious stretch for me. However, it's good to multitask while the paint dries. Anyway, here's a photo of one of the drawings I've been working on. If you want to follow more of what I've been doing here in my apartment studio, you can follow my Instagram: @Jonezee85. Happy thursday! I'm a little late in posting this morning. I was choosing music from YouTube's library for the video. And...if you're getting tired of the videos, this is the last one in this series! Hopefully the next bunch will have a better positioned camera. I've been doing a little research, and I think I have an idea. Now, I don't know if you realize this, but halloween's just a few days away. If you haven't thought of your costume yet and, TBH, can't be bothered, then I've thought of a few things to help you out. They all involve your bathrobe. You're welcome. Here's an image of what I'm talking about. 2. Hugh Heffner. That is...if you have a satin bathrobe. 3. Elle Woods in Legally Blonde. You can get the bathrobe here. Here's a reference image. And Here's where you can get it on Amazon. It's not Prime Eligible, but you'll wear it again. Here's a reference Image. Here is a prime-eligible option on Amazon. I think the light pink is the closest option, but you'll also need some pajama pants to go with it. 5. 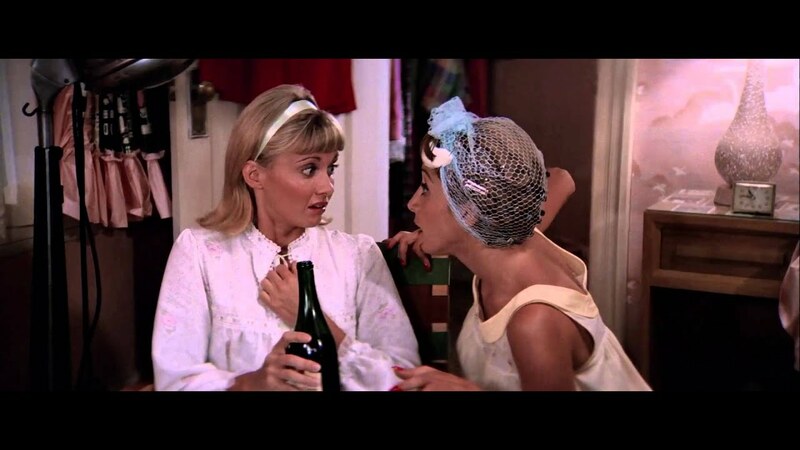 Remember the sleepover scene from Grease? Perfect group idea. Here's a video if you've forgotten. 6. Rocky...or any boxer for that matter. 7. 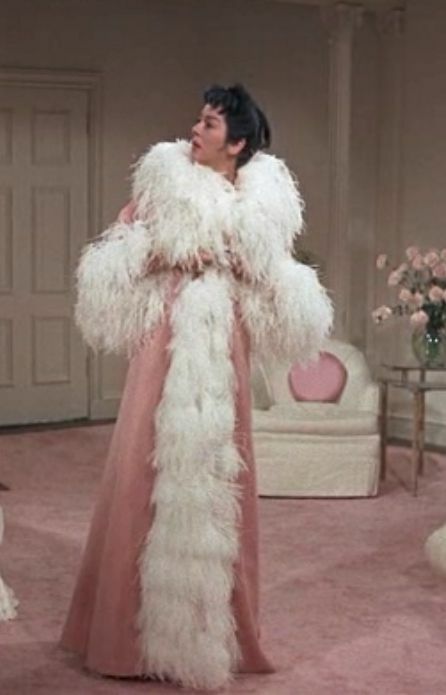 Auntie Mame. All you need is a couple feather boas to attach. 8. 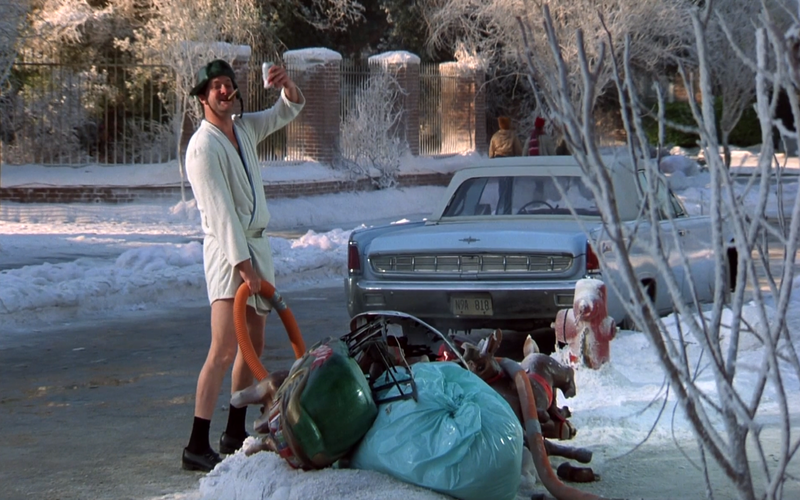 Cousin Eddie in Christmas Vacation. 9. Crazy Cat Lady. Run a google image search for "crazy cat lady costume." There's plenty of material out there. 10. "Netflix and Chill" or "Funemployed." You decide...and you interpret. Now, you I think you have a little less work to do than when you thought you were actually going to have to make a halloween costume. You're welcome. Ok, so as you'll probably be able to tell by watching today's video, I painted three cards in rotation and then edited them to be separate videos. This one, though, I did something a little different. Using the loops feature in garage band, I even made my own music for the background! I know, I know. The music isn't as cool as the day before, but I'm learning! While you're reading this, I'm probably already up and working on some portrait orders. However, check back tomorrow for more time lapse fun! Well, I'm back! 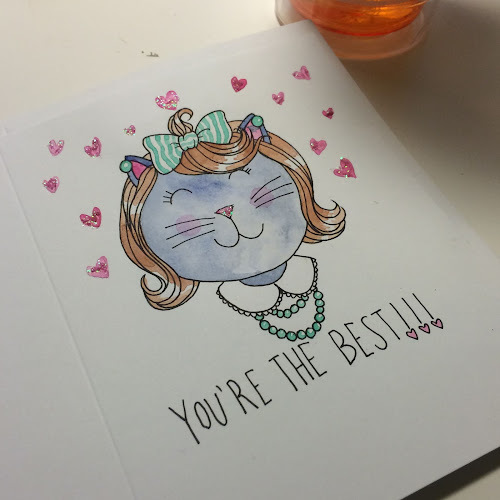 And I made this time lapse video of another greeting card! I have a couple more of these on deck, so stay tuned! Happy Monday! Well, good morning. As promised, I have added some new items to the Etsy Spinster Store. Most of them are patches like the one above (and I've got way more to add), but there are also some little puppy paintings! Now that I've left that there for you to peruse, I must tell you that I will be taking a week or so off from blogging. Do not worry! I'll be back soon! 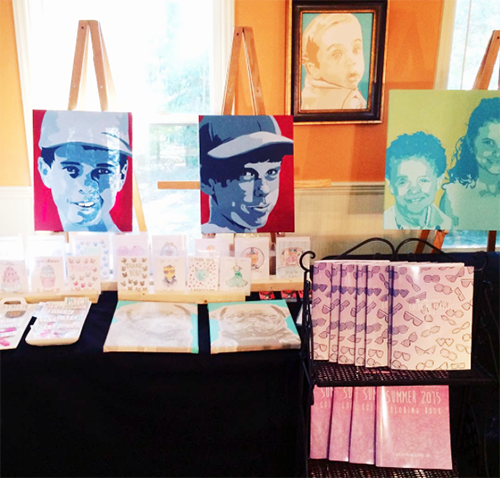 Yesterday was the finish of Art In The House, my first ever craft show. I've been wanting to have a booth somewhere for years - eve a flea market booth, and I think I'll do it again. Well, I know I'll do it again, since I've already got a booth for ICE Atlanta. I didn't sell too many of these. I think perhaps this wasn't the crowd for iron on patches. 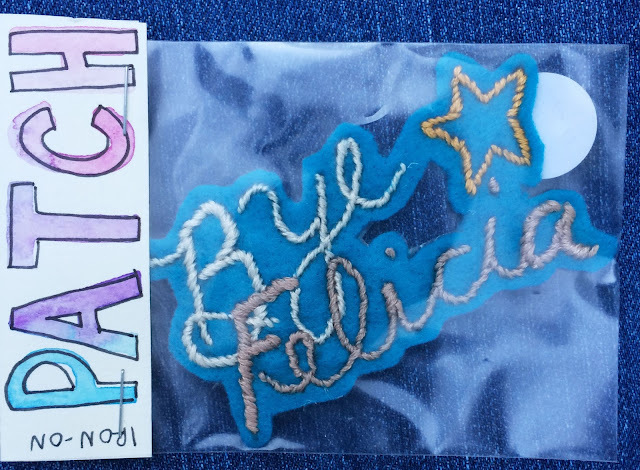 I did sell some lips, a "cat lady" patch, a unicorn, a cupcake, and a cat badge. I'm going to put the leftovers on my Etsy and see how they go there. However, this trend may not have caught on yet. I sold some coloring books. Most of them, though, were to people I know. One person said that the "Spinsterhood Diaries" emblazoned on the cover was a deterrent because, while she wanted to get one for her daughter, she thought the "spinster" part would offend her. Fair enough. I still have copies, though, and we'll see how they go at ICE. The next coloring book (hopefully Atlanta-themed) will probably not have "The Spinsterhood Diaries" on the cover, though, but instead just a web address on the back. I didn't get any definite orders at the craft show, but I did get lots of interest and business card-takers. I think it's too soon to tell whether or not this particular show was a fruitful form of advertisement. However, I was able to borrow four paintings from past clients, and therefore was able to photograph more of my previous work. The pop art portrait gallery on sarahjjonesart.com has been updated as of this morning! Go have a look! I also had lots of questions about pricing and so have updated the pricing section on Sarahjjonesart.com as well. Now I've covered all portrait options available in case anyone needs to place an order! By far this was the most successful part of my table. As of the end of the show, I sold all but six of the cards I brought to the show, and my dad bought those to send around - mostly to help me out, I think. However, I'll take it! That means I officially have zero greeting cards left. My plan is to have between 50 and 100 cards for the ICE Atlanta show since I think we'll have more foot traffic there than we did at Art in the House. In the meantime, I'll also make some for my Etsy shop. Hopefully by tomorrow I'll be able to link to an updated and restocked Etsy Spinster Store. I did meet a bunch of fun crafters and artists that I hope I'll see again. It will be interesting to see where their craft adventures take them! If you want to see photos from the whole event and link to some of the other vendors, visit the Art In The House Facebook page. They've been doing this thing for 8 years, so there'll be another one in a few months, I'm sure. All right. I hope you all have an excellent Monday. I need to drive back to ol' A Town and paint some portraits! Today was the third day of Art in the House, and it went much, much better than Friday. 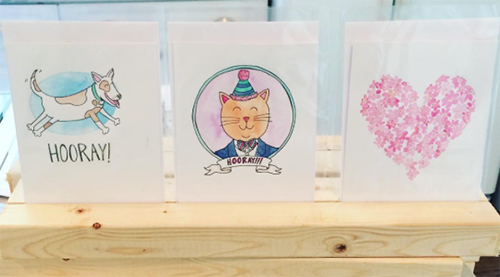 I'm actually almost out of greeting cards! And I sold the Unicorn patch I wasn't sure anyone would want....well, anyone but the coolest unicorn lovers out there. Duh. One showed up to the house today, and she took it home! Now, in case you've been waiting for Instagram updates, it pains me to tell you that I have little-to-no connectivity in the Art in the House location. So, I can't post to Instagram as much as I'd like because I have to walk down the block to get a signal. Sigh. A problem that couldn't have existed before the invention of Instagram or the iPhone. 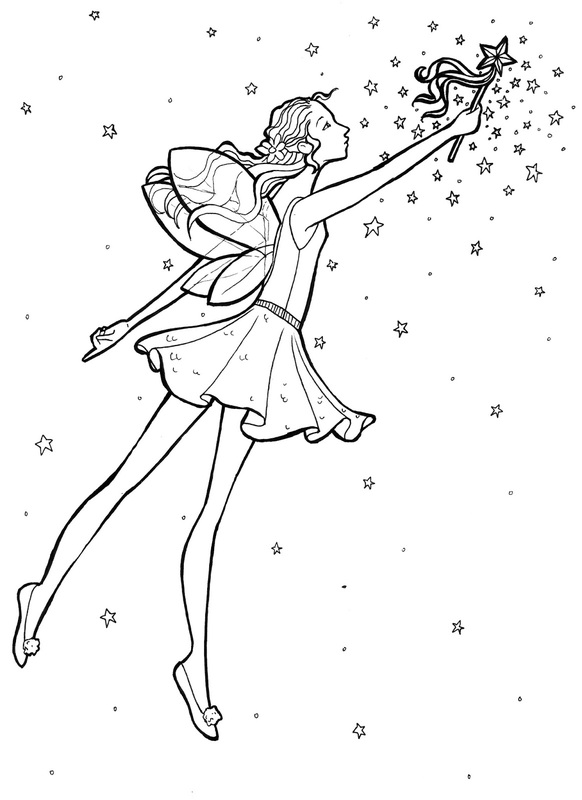 Today I've posted one of the images from the most recent coloring book. I posted this one because I have become obsessed with one of the Art in the House vendors. Their name is Living Coastal Design, and they make clothing and furniture for American Girl Dolls. In their little store area, they have a Samantha Doll dressed in a little witch costume. While I didn't have an illustration of that, I thought a little fairy in a tutu would be close enough. 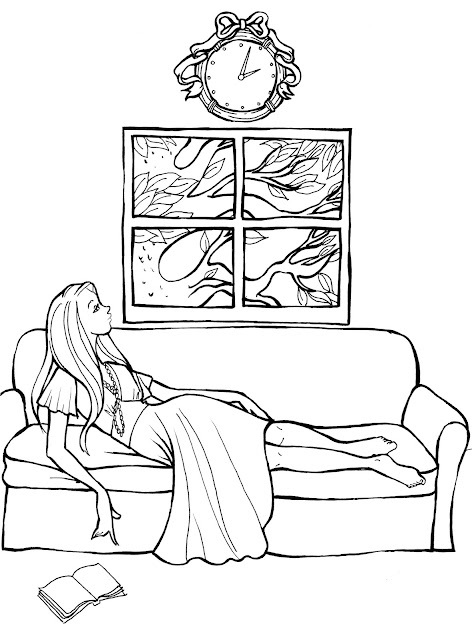 So, enjoy this coloring page, and have a happy Sunday! Yesterday was a slow day for me at the craft show. However, I did have the opportunity to meet quite a few interesting characters. There was the lady whose feet are pictured above. 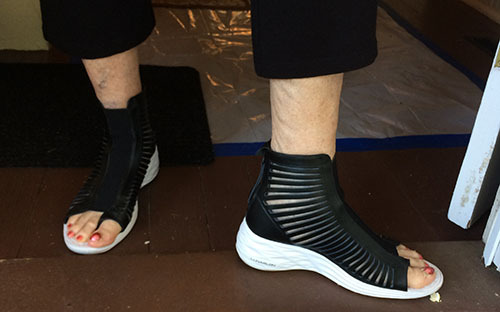 She was a senior citizen who had purchased these super hip shoes from the Nike website because the black and white spotted shows with red linings that she originally wanted were out of stock. She said she buys so many shoes that she has to give some away periodically just to make room for the new ones she's buying. #lifegoals. I also met an older gentleman who teaches dance classes and says he can break dance and sing gospel music, too. He even gave us a little sample of his tango dancing right there in front of my table. He was also full of jokes...the kind that make you laugh, but not the way the performer intended. This man was amazing, and I must admit, he was quite spry. I'm hoping that today brings a little more foot traffic and business, but in case it doesn't, I've got this photo in my phone to keep me busy. Miranda just needed to wear this little collar mom found at my grandmother's house. I think it suits her quite nicely. However, she won't be wearing it for any period of time because...well, she has a history of eating leashes and harnesses, so we don't want to risk it. I hope you have a glorious Saturday! The weather here in SC is excellent, and today there are two art events right across the street from each other: Art in the Park (at Memorial park) and Art in the House (on Salem Street) So, stop by both! Yesterday was the first day of the craft show, and I think it went pretty well. Mom wasn't able to make it, so I halfway set up her table and hoped for the best. Even though she wasn't there, she got two orders anyway! Above you'll see a poorly-taken photo of my booth. I hope to get a better one today. I'm in front of two windows, so it's a little hard to position my sample portraits correctly. However, People are taking cards, so I think that's good. Now, the best news is this: I've already made back my booth fee, so from here on out, it's all fun! The watercolor cards are selling best, by far, and I'm afraid I may run out today - which is the best result I could hope for. I'll take note for the upcoming Indie Craft Experience and make sure I have a lot more. As far as the other vendors go, I have to say that far and away a woman who has pretty decorated cookies is selling the most. She said she's already run out of all of her University of South Carolina cookies. That doesn't surprise me because I went to USC, and I love cookies...though I'm not the one who bought or ate all of them. If you live in the Sumter, SC area, come stop by today or this weekend! If you come around lunch time, you may just witness me eating a home made peanut butter and jelly sandwich from a ziploc bag. And isn't that what you always wanted? I thought so. Here's a link to the postcard with all the info! I'll keep you updated, and hopefully I'll have a better photo tomorrow. Ok, ok. So, I didn't make this for Inktober, but I did post it on Instagram for Inktober. Because I drew the outline with a sharpie pen. Then I added watercolor and glitter. This is one of the greeting cards I'll have at my table at Art In The House, which starts tomorrow! This is my first craft show, so I'm really interested to see how it goes. I've always wanted to do a craft show, so I'm hoping it's everything I've imagined. 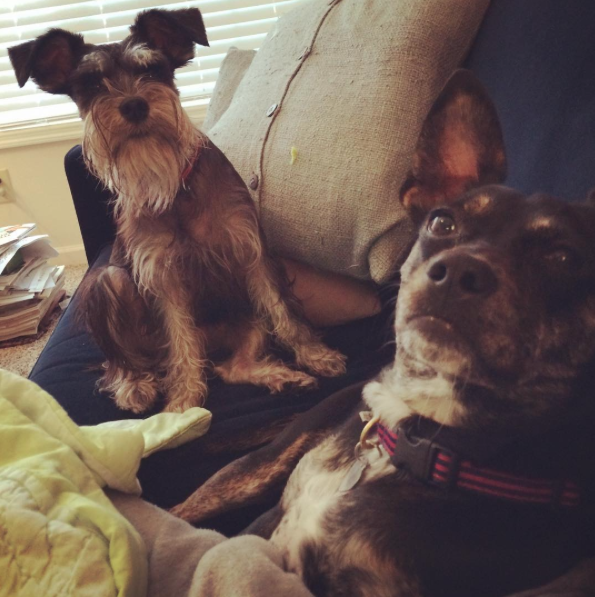 Also, lease enjoy this selfie Miranda and her best friend, Stella, took yesterday. It's Tuesday, and I've been hustling and bustling around my apartment getting ready for Art in the House this weekend. For my table, I've got quite a few different things: watercolor greeting cards, iron on patches, and coloring books. Since I can't actually sell portraits at my table before they've been commissioned, I decided to paint a couple of sample portraits for display. What's cuter than baby animals? So, I chose puppies. The images you see here are pretty much finished. They need a little touch-ups, and the one on the left is still wet, of course. I'm interested to see what sort of reaction these get at the show. While I've been working, I've been catching up on This American Life, the first season of How To Get Away With Murder, and now The Great British Bake Off. I recommend them all...except if you are squeamish or easily offended, then don't watch How To Get Away With Murder. All right. It's back to work with me. Happy Tuesday! When I embarked on my new life outside of the corporate world, I thought I'd have a lot more free time on my hands. I didn't anticipate that I'd move seamlessly into full time art making. It's a delightful surprise to have so much work to do! I've been painting pretty much nonstop since I came back from the flood in South Carolina. While I was waiting for the flood waters to recede, though, I had a different idea of what my days would look like. And so, I pinned a lot of pins. As a spinster, I'd like to think I can do just about anything anyone else can do. However, life experience, and my sculpture class in college have taught me that I'm not really a great carpenter. It's too exact a science, and I don't have the patience for most things so finite. Given half the chance, though, I like to forget these facts. Today, I'd like to share some of my DIY pins so you can either laugh with me at my ridiculous ambition or gain some inspiration from my Pinterest. Let's do this. 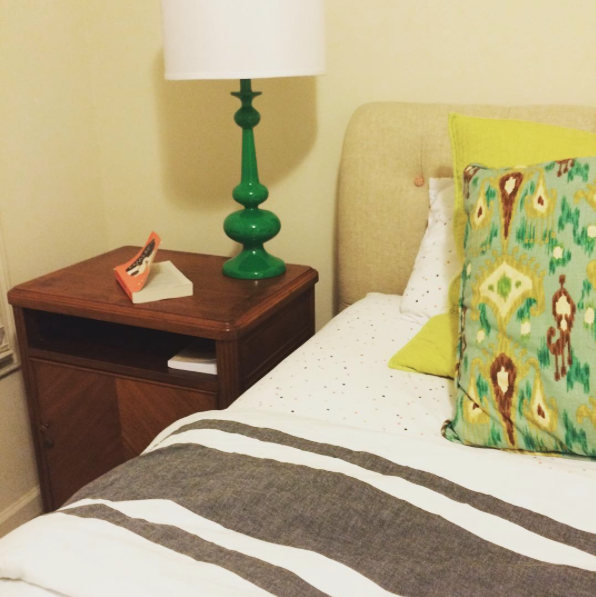 This is a great way to pay less for a night stand...if you just buy a wooden box instead of making one. However, if I did this, I guarantee every book, glass, phone, or pair of spectacles I set on it would slide right off. (Notice how I spelled it like that one Seinfeld episode. Just imagine me saying it like that. ) I could theoretically achieve this, but it would look like a hot mess. 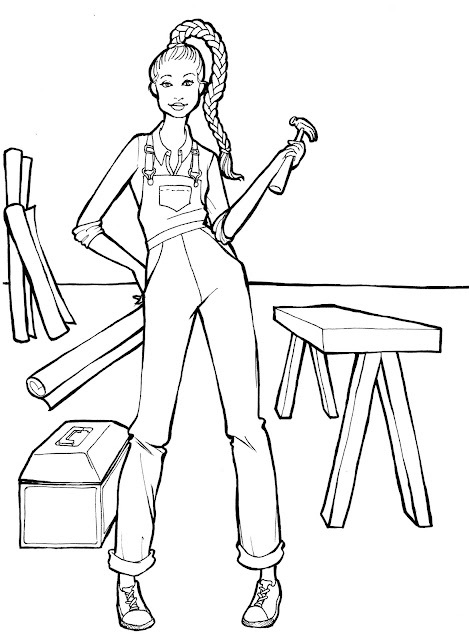 And, tbh, I'm not sure I think the one in the DIY article doesn't also look like a hot mess. Ok, this is an adorable idea. I love it. It would have been especially great in any one of the places I lived in New York. However, if I had a murphy desk, it would stay perpetually open because I'd never clean it off. So...that kind of ruins the whole point. This is beautiful, but I have tried to make resin coasters and jewelry, and I can't even do those right. So, I think it's safe to say the table would be a disaster. I can assemble the pipes, but I need help with the top. Anyone? For now, I'll stick to painting. If you want to make me a table, though, please feel free! Yesterday, while working on greeting cards, I had the bright idea that I would make a video of myself working on them. Well, above is the result. I clearly need to work on my video skills and laptop camera positioning, but I thought I'd share it anyway. Because it's only 2 minutes in fast motion, and I even added a little of the free YouTube music, too. Enjoy, and have a happy Sunday! 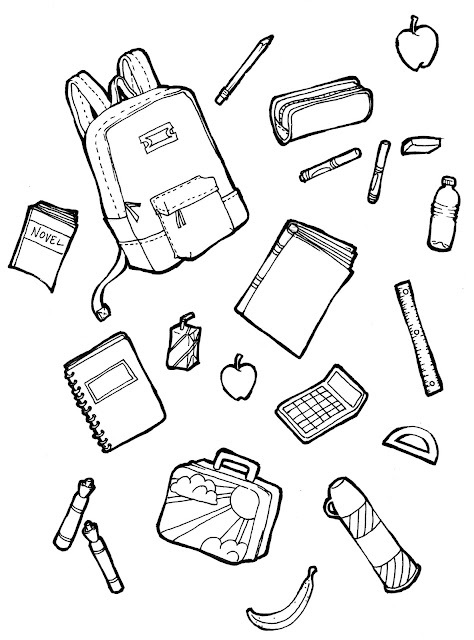 Anyway, Today's coloring page is school supplies because I love school supplies, but if I were in school, I'd be glad it was Saturday. Now that I think of it, I'm not in school, and I'm still glad it's Saturday. 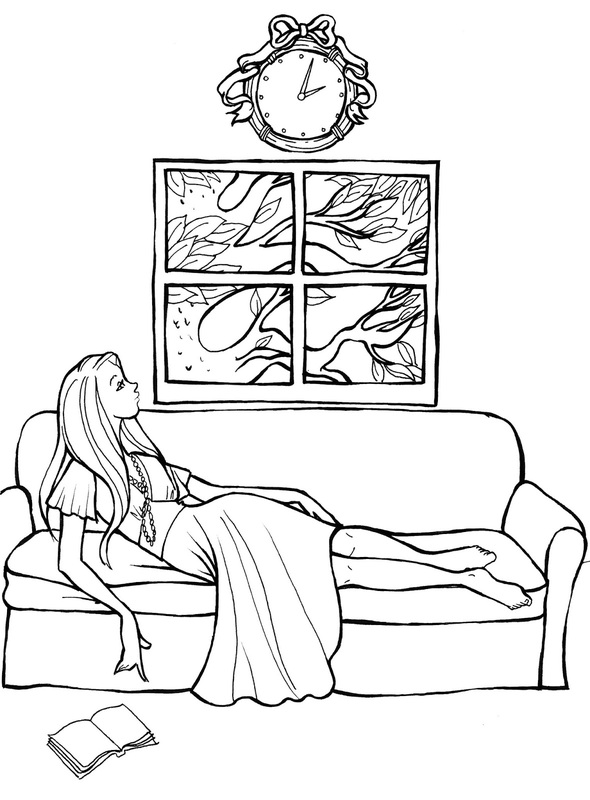 So, Enjoy the video and enjoy the coloring page! Happy Saturday! So, I haven't done Free Art Friday in a while, and I believe I'll have the chance to drop something today. 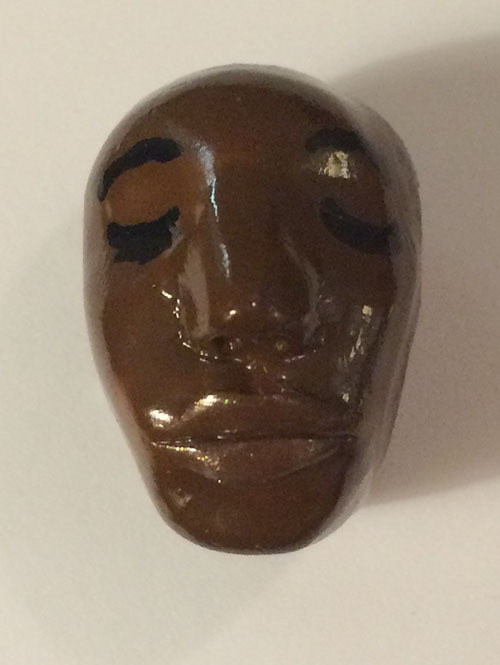 So, here's one of the little human heads I made a while back and have been meaning to post. Keep your eyes peeled on Instagram to see where it lands! Now, if you hate reading other people's dreams, then just stop reading now. This is a short one, but it was a dream specifically about this blog, so I had to share. I was with my childhood friend Macky, and we were eating popcorn off the floor at her parents' new house. Then we went outside, and there was some sort of festival going on. At the end of our travels around the city (I don't know what city, but I seemed to think it was Charleston), there was a bar in which they were having a meet-up. Part of this festival was all about meet-ups, so that in itself wasn't that weird. The weird part was that it was a Spinsterhood Diaries meet-up, and I had nothing to do with it. There was a girl walking around giving out goodie bags related to The Spinsterhood Diaries, but the colors were all wrong. People were definitely there for this Spinsterhood Diaries and not another one. So, I walked in and introduced myself as the author and illustrator of this blog. And no one cared. They liked the blog but didn't care to meet its author. So, then I felt weird, and I went outside, and I lost my shoe. And Macky turned into Meredith. The end. That was such a weird dream. After crouching at my drafting table for most of the day yesterday, I decided to give myself a little treat. I had been talking to a friend a few weeks ago about a place called Plaza Fiesta, which I've been passing on my way to get pho for so long. Yesterday was the day I decided to visit. I didn't quite know what to expect, but my mind was blown. There were so many random, wonderful things, I had to share some pictures. 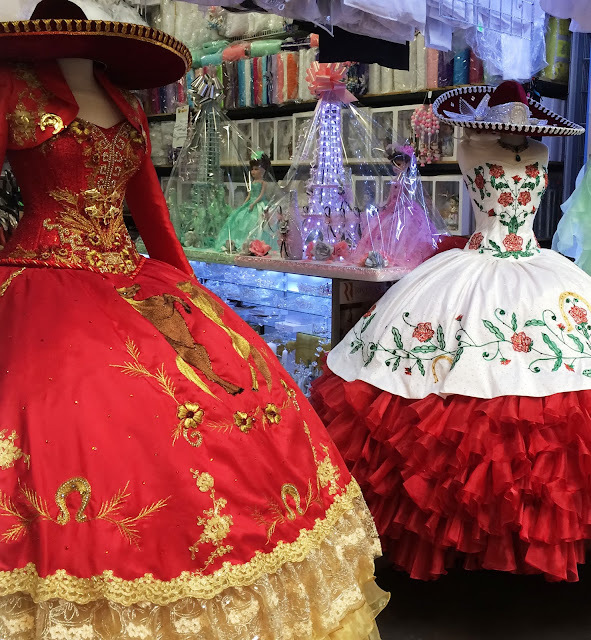 Above you'll see two gigantic embroidered dresses. I'm not sure what what sort of event these are meant for, but just look at them. You may need one for your Christmas Card photo. 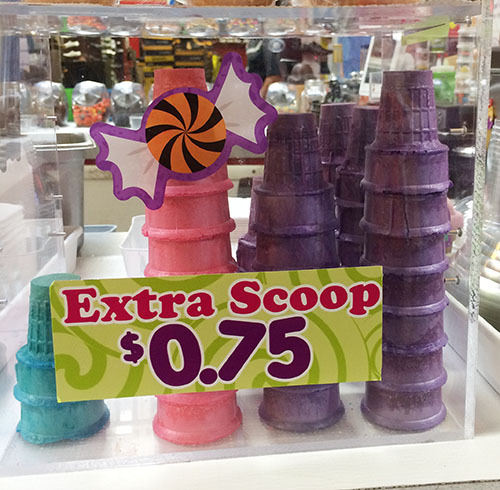 The crazy thing about Plaza Fiesta is that it's fairly equally food and merchandise. The first thing I saw when I walked in was a bakery called Squisito (a google search for this lead me to this interesting blog - Spatial Drift, and I thought I'd share.) I passed it on the way in, and on the way out I got a corn muffin that was actually made with whole kernels of corn. Above, though, you'll see the super-sprinkle cookies that you can find in most Mexican bakeries. They're always a little dry for me, but they're so pretty! Speaking of food, there were at least three or four ice cream stands. This one, in particular, had colored cones, and I loved that. 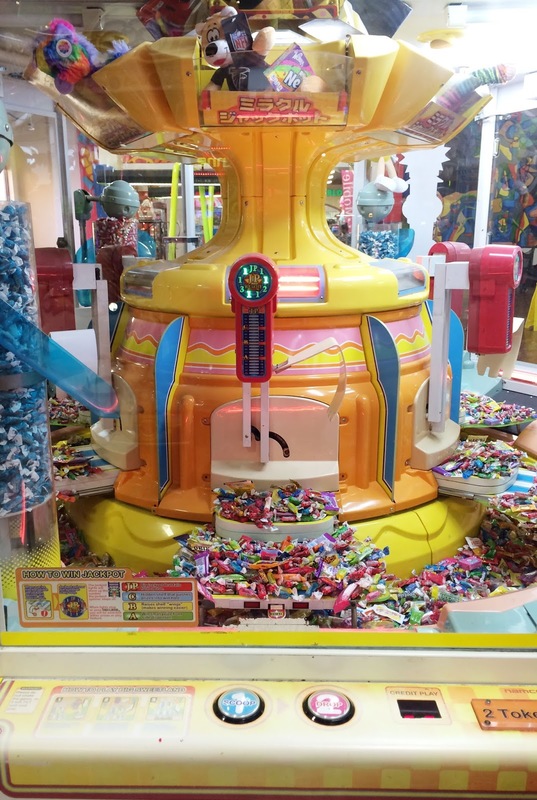 Around a corner, there was a little arcade, and I saw a little boy dragging a trail of tickets taller than I was. There were little knickknacks and the like as rewards for playing the games, but if you ask me, the candy machine is its own reward. If you follow me on Instagram, you saw these fabulous leggings yesterday. 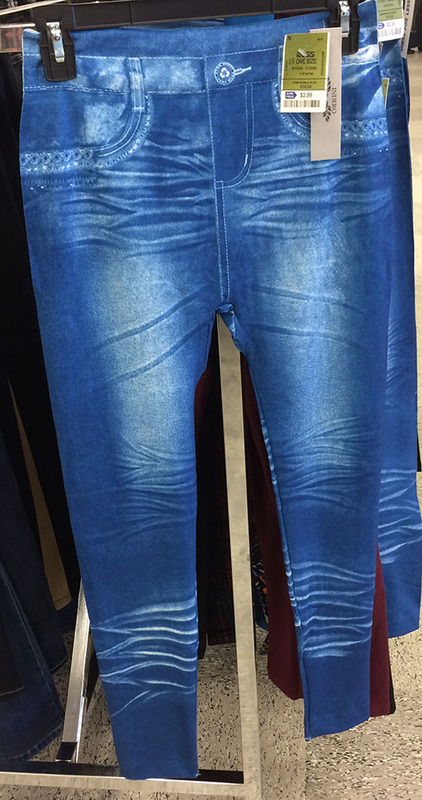 They're just regular leggings, but some fashion designer took it upon themselves to print an entire pair of jeans on the front and back of them. Just wow...There's no wonder they were $3.99 at Ross. And yes...there's a random Ross in Plaza Fiesta. And lastly, they don't just having clothing and food at Plaza Fiesta. 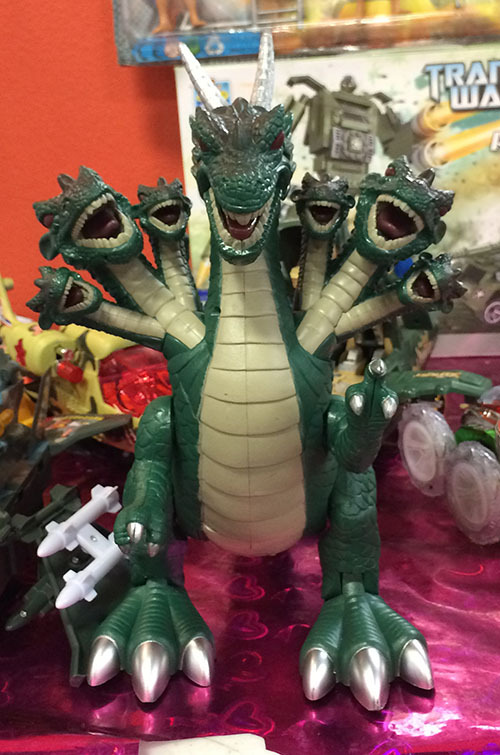 They also have jewelry, electronics, luggage, furniture, figurines, and yes, seven-headed dragon toys. Now you know where to get them. You're welcome. Since I haven't been working in an office, I've been having a little trouble keeping a schedule. This week is the first week where I have actually set out to do my spinsterly work on a semi-regular time table. However, four-mile morning walks with Miranda in which I plan my day have been taking longer than I might have expected. Still, I have managed to get a lot of work done. Last night I finally started working on the greeting cards I'll have at my Art in the House table. Just a little something fun and inexpensive. 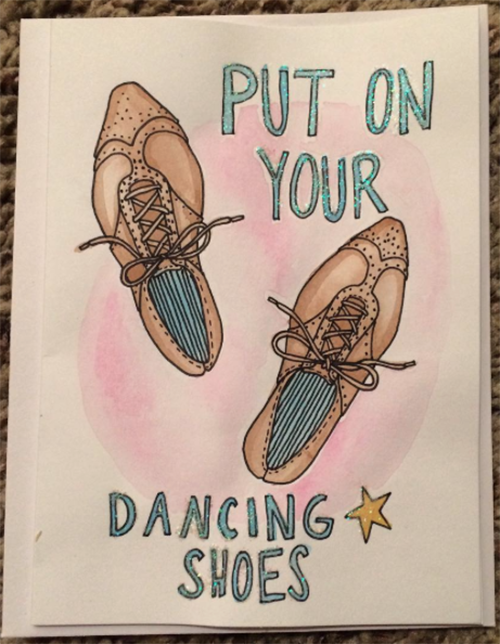 They're all hand painted with watercolors and then glittered afterward. Above is an image of one of the ones I did last night. This morning, this is my first order of business so they can dry while I finish up on a pet portrait I have due this weekend. While that dries, I'll go back to glitter up the watercolor cards. Ok...enough planning. I must get to work! Stay tuned for more images of the little cards that will be available soon! Well, spinsters, I made it back to Atlanta in one piece, and I even brought my new nightstand upstairs last night. Above is a photo in case you were wondering what random bedding I had put on my bed before I left Atlanta. That's Crazy Rich Asians on the bedside table, and I am loving it so much so far. However, I will wait to write a full review until I've actually finished it. That lamp is from Sumter Lighting and Home. I went there this weekend, and I was blown away. I daresay that store is as well put together as any in which I shopped in Chelsea. The website really doesn't do it any justice. Now, In case you were wondering if I got on the news about the flood, I did not. however, the woman in the below video pretty much did everything I would have done - especially the part about the pizza. Well, and of course her dog. I hope this gets attuned soon. Enjoy! Well, in case you haven't heard, almost the whole of South Carolina is flooded. Before any of that happened, though, my mom and I went to the Sumter County Fair in the rain. We just wanted to see the quilts, crafts, and the art show, so we didn't actually have to be outside, but we had the whole place to ourselves, save the people working at the booths and exhibits. We saw some pretty impressive quilts, but I've chosen to show you one of the ceramic entries as today's main photo. That cat looks like it just smelled something, and I love it. In the art show, we saw some great student artwork, including this item by one of my high school art teacher's students. I embedded it, and I think that's pretty fancy. In other news, I have tickets to see Amy Schumer and Aziz Ansari tonight in Atlanta, and there aren't enough emojis in the world to describe how sad and annoyed I am at this rain. Say a little prayer I can make it, guys. There's nothing a Spinster likes to laugh at more than a good ol' Amy Schumer rant about being single. And, of course, Aziz Ansari write Modern Romance, so... it's kind of necessary. All right. Enjoy your Sunday. 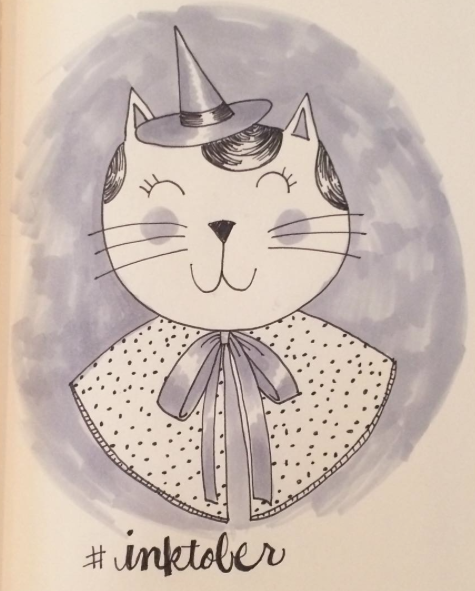 October on Instagram is Inktober! 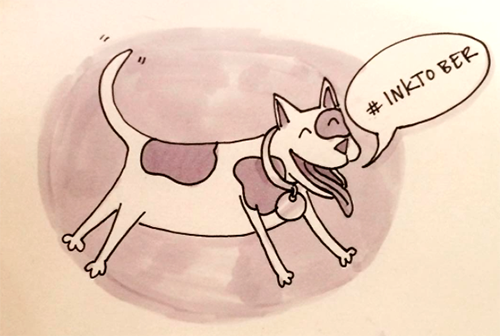 Below you'll find yesterday's image, but today's image is this happy little dog telling you it's Inktober. These two images are particularly appropriate for the Southeast right now because it is raining cats and dogs around here. My inks for these two are a sharpie pen and two shades of grey Copic marker. I hope your Saturday is excellent. 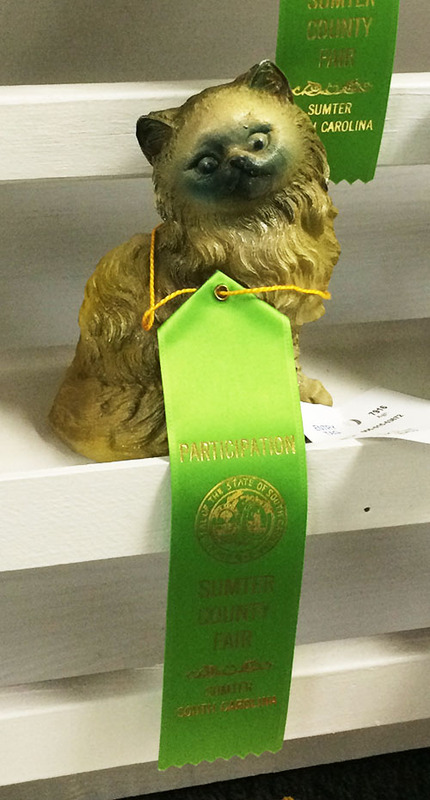 Mine will be rainy, but I'm still going to see the art exhibit at the Sumter County Fair. Photos, of course, to follow. If you can't wait until tomorrow for photos, please follow my Spinstergram (@Jonezee85). One of the things about being a Spinster is that I am able to eat whatever I want for dinner every single night. I never have to plan a real, balanced meal. Therefore, I've made it to the ripe old age of thirty without having made dinner for more than, say, two or three people. Last night, though, I made dinner for seven. I will admit that there were a couple dishes that I didn't make. I didn't want to risk it, so I had my dad pick up some fried chicken I'd ordered at the Piggly Wiggly. With that taken care of and my sister-in-law making a pretzel-jello salad, I wasn't left with too much of the hard stuff. 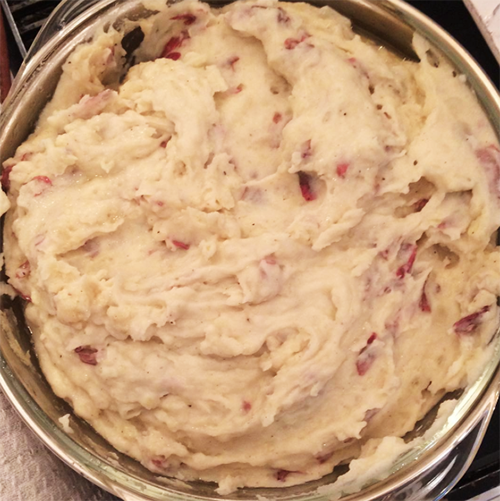 Above you'll see a photo of my very successful mashed potatoes. I used the Creamy Mashed Potatoes recipe my sister sent me on Pinterest, substituting red potatoes so I didn't have to peel, as well as her EVOO Drizzled asparagus recipe. Of course there was a salad, but that only required some chopping and grating. And then, I made Sister Schubert's Rolls because...why mess with perfection? I must say, I survived! And it was pretty good, if I do say so myself. 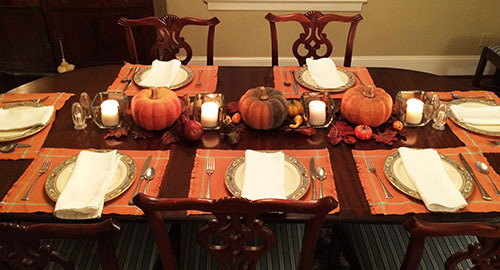 While I cooked, though, I did have to ask my mom to do a centerpiece and table direction. Sorry, mom. So, here are some photos of more finished products! Here's my Asparagus. 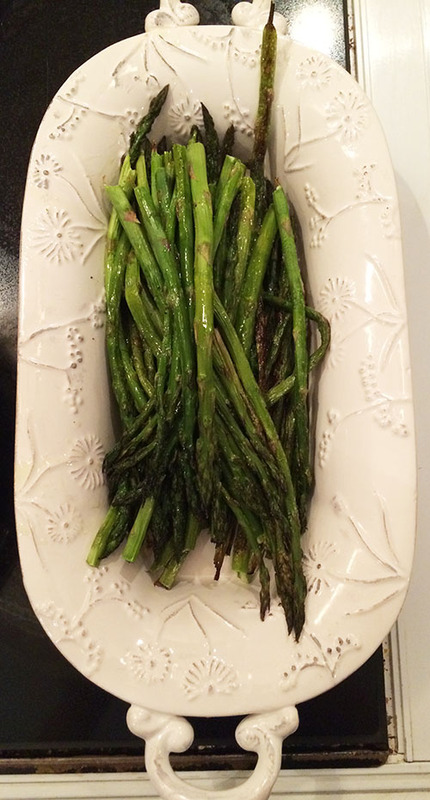 It was so easy, and somehow I always think Asparagus is more sophisticated than green beans. I daresay it was delicious. And, I can't take credit for this, but my mom did make a beautiful table. I can, however, take credit for the placemats because I wove them at Penland School of Crafts. Everything else, though, is all my mom. So, I think we had a successful dinner, and I am proud. I hope you'll try the recipes I linked herein because...they were delicious and easy enough for someone who rarely cooks. Today is my mom's birthday. So, if you see her, please wish her a happy one. Tonight I will be cooking an actual dinner for seven people (yes, my Spinsterhood one who made it an odd number...unless we count Miranda) for the first time. I'm thirty years old, and somehow I haven't done this yet. So, wish me luck! I'm having a little help from my sister in law, so it's not 100% on me. Thank goodness. But still...do wish me luck. I'll show you pictures tomorrow, no doubt. 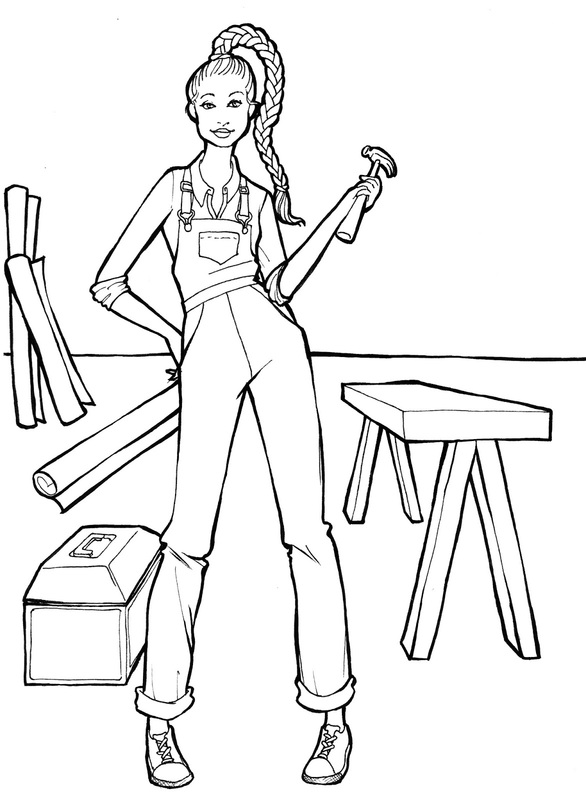 In the meantime, you can print out this coloring page and color it up for my mom. She likes pink and green, so maybe you can do some of the balloons in those colors. So, happy birthday to my mom! Though I know birthdays aren't really all about presents, I can't wait for her to open hers!